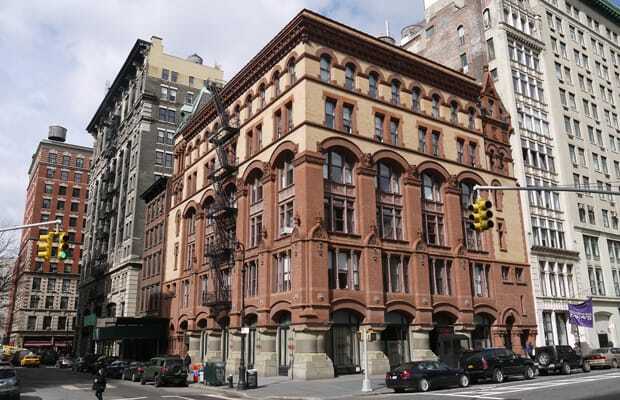 Built on the site of the former Schermerhorn family mansion, the Schermerhorn Building (380 Lafayette St.) is one of architect Henry Janeway Hardenbergh’s most exquisite constructions. The Dakota Apartments, built eight years earlier, may be a better known example of his work, and the Plaza and original Waldorf-Astoria (demolished for construction of the Empire State Building) hotels may be more recognized by name, but this building was the first of his to receive Landmark status. The Schermerhorns were one of the more prominent New York families of the 19th Century. Their family is related to the Astors by marriage through daughter Caroline Webster Schermerhorn, known as the The Mrs. Astor. The families feuded internally, which resulted in the demolition of the Astor home so that the original rival Astoria and Waldorf hotels could be built. The Schermerhorns also decided to demolish their family home to construct a factory dedicated to the manufacturing of boys’ clothing. This building, commissioned of Hardenbergh, was built in the Romanesque style. The building is constructed as solid masonry bearing walls, meaning that the weight of all the construction is carried in the brick exterior. As a result, the walls are extremely thick—over three feet of brick. While the large three-storey arched windows give the building a lightness of appearance, the squat columns at its base—in accordance with the Romanesque style—indicate the tremendous weight. The building seems both light and heavy, a massive red and tan block floating above the corner. The ornamentation is equally striking. The capitals of the pilasters between each bay are adorned with either a male or female visage, and the break between the second and third floors is accented with a row of decorative finials. The outside corners of the building are somewhat heavier, with the tan brickwork extending lower and small deep windows that punctuate the façade. The base arches are also smaller and heavier to give presence to the two entrances on either street. Breaking from the almost square symmetry of the building (though its proportions are closer to 4:5 based on the even bay windows) the outside corners are capped by remarkably different roof motifs. The external fire stairs, added later to comply with new NYC building restrictions, further offsets the different street facades. The building was converted into an office space in 1931 and has remained primarily that, although the ground floor is now home to the Chinatown Brasserie.